It’s a dessert that is popular in nearly every street and household across India and the subcontinent. Did you know that Malpua is India’s oldest known dessert? Malpua are small deep fried pancakes that are soaked in a sugary syrup, come in various forms across India. The first references can be traced back to Rig-Veda where it is called Apupa. 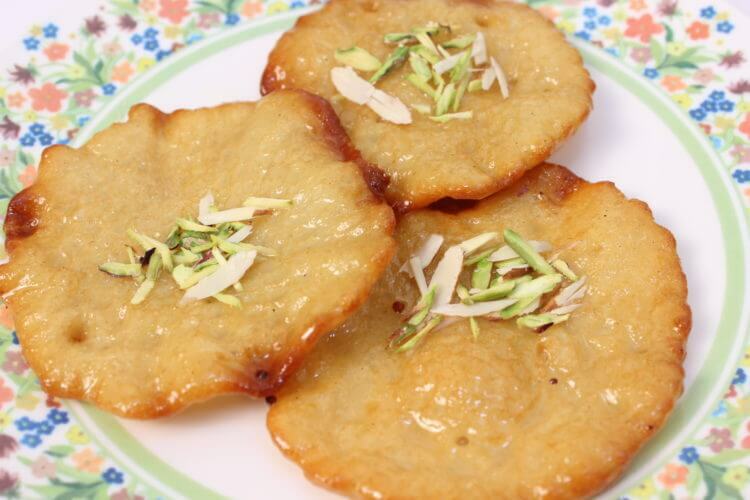 Today, the malpua is popular and is a must-have during festivals like Holi, Diwali and the Ramadan. The fluffy inner texture and crispy edges with glistening sugar coating is simply mouthwatering. It is one dish that is famous in all most all Indian states but the preparation differs from region to region. Today recipe is my take on the preparation of Malpua. A step by step guide to help you make this sweetmeat! In a bowl add all purpose flour along with milk powder, Sooji, green cardamom powder and mix these dry ingredients well. Add milk in small batches to make a smooth semi thick batter. Now set it aside for 4-5 hours. In case you want to make the dish instantly, you can add eno and set it aside for 1-1.5 hours. Now add Kesar and check the thickness of the sugar syrup as shown in the video. Switch off the flame. In a deep bottomed pan heat oil. Now pour a spoonful of batter directly into the pan. Let it cook for a minute on low flame. Now flip the other side over using the way shown in the video. Cook on the low medium flame until light golden. Take it out on a plate and dip it in the sugar syrup. Let it in for 2 minutes so that it can soak in the chashni. Similarly, make all the malpua. Now garnish with pistachio and almond flakes and serve your guest with deliciousness. I hope you enjoyed watching as much as I enjoyed making it for you guys. Do try it in your kitchen and say goodbye to readymade sweets. Let me know your thoughts on this recipe in the comment section below and your feedback is valuable to me.